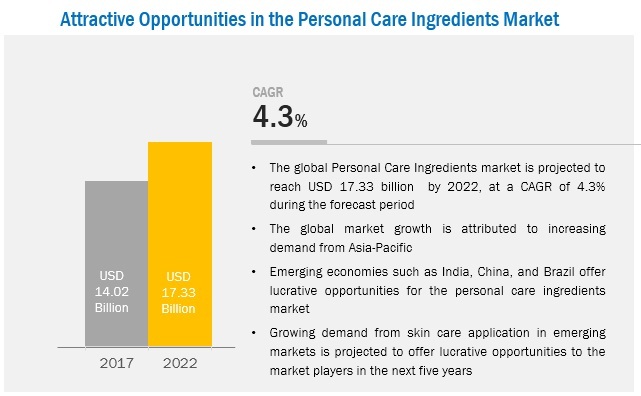 [148 Pages Report] The personal care ingredients market was valued at USD 13.35 billion in 2016 and is projected to reach USD 17.33 billion by 2022, at a CAGR of 4.33% from 2017 to 2022. Personal care ingredients are used in personal care products that include skin creams, skin oils, toothpaste, hair oils, hair conditioners, hair shampoos, make-up products, and others. The demand for personal care ingredients is attributed to increasing demand for ingredients such as anti-aging agents, exfoliators, ultraviolet (UV) agents, moisturizers, antioxidants, and antimicrobials. Stringent governmental regulations on the use of synthetic personal care ingredients in Japan, China, the U.S., and European countries are restricting the growth of the personal care ingredients market. The base year considered for the study is 2016, and the forecast period is from 2017 to 2022. The growing demand for improved functionality and multiple benefits from a single product is a major factor driving the demand for multifunctional ingredients in personal care products. These multifunctional products contain both active as well as specialty chemicals. The active multifunctional ingredients can provide more than one function in a particular personal care product. For instance, blemish balm (BB) cream that has been promoted as a multifunctional product can treat various skin problems such as aging, dullness, and tanning because of overexposure to the sun. 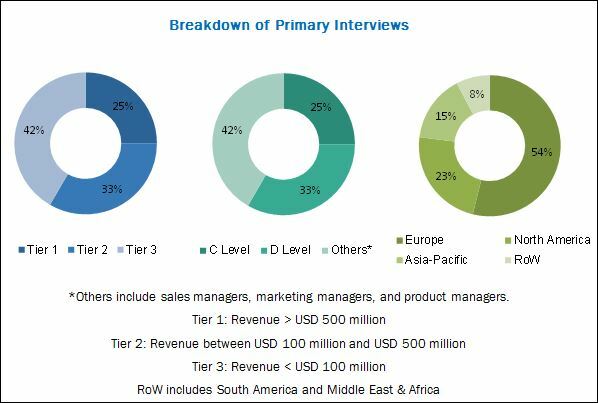 The ecosystem of the personal care ingredients market comprises manufacturers of personal care ingredients, such as Ashland Global Holdings Inc. (U.S.), BASF SE (Germany), Croda International Plc. (U.K.), Evonik Industries AG (Germany), Lonza Group Ltd. (Switzerland), Solvay SA (Belgium), Akzo Nobel N.V. (Netherlands), Clariant AG (Switzerland), The Dow Chemical Company (U.S.), and Wacker Chemie AG (Germany). In April 2017, Ashland global holdings acquired Pharmachem Laboratories, Inc. (U.S.), a leading provider of ingredients to health & wellness industries and products to fragrance & flavor houses. The acquisition helped the company in increasing its product line. In April 2017, Ashland global holdings introduced three products, namely FiberHance; Antaron; and Harmoniance for hair, face, and body care products. The new product launch helped the company to significantly strengthen its product portfolio. In April 2017, BASF SE introduced three new ingredients, Collalift 18, Oligolin, and Cetiol 4. Collalift 18 and Oligolin, are active ingredients used for reducing signs of ageing. Cetiol 4 is emollient used for various applications such as face care, body care, color care, antiperspirants, and deodorant. What are new ingredients which the personal care ingredients companies are exploring? 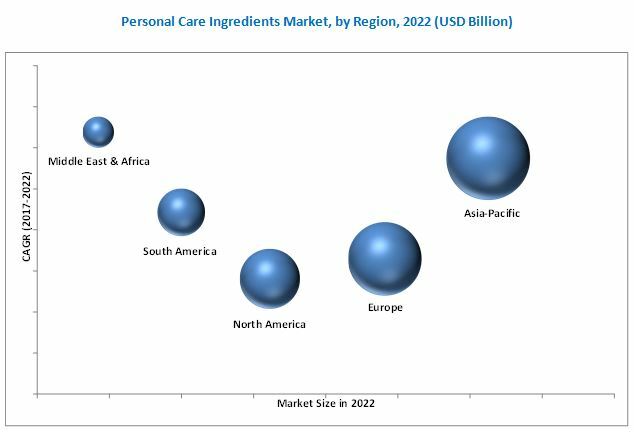 The personal care ingredients market is expected to grow from USD 14.02 billion in 2017 to USD 17.33 billion by 2022 at a CAGR of 4.33% from 2017 to 2022. The market is driven by the increasing demand for personal care products such as skin care creams, hair shampoos, hair conditioners, and sunscreens, among others, with multifunctional ingredients. Changing lifestyle and rise in spending capacity in developing countries such as India, China, and Brazil are expected to drive the demand for personal care products, which, in turn, will drive the market for personal care ingredients. Personal care ingredients are a group of chemicals used in skin care, hair care, oral care, and make-up products. Some of the major types of personal care ingredients are emollients, surfactants, emulsifiers, thickeners, antioxidants, active ingredients, and others. These ingredients provide physical or functional properties to the final products. On the basis of ingredients, the personal care ingredients market is segmented into emollients, surfactants, emulsifiers, rheology modifiers, active ingredients, and others. The emollients segment dominated the market in 2016 owing to their use in every application in skin care products, ranging from face creams to skin cleansers and shampoos and conditioners. The active ingredients segment is projected to register the highest CAGR, in terms of value, between 2017 and 2022. The demand for active ingredients is due to the growing demand for multifunctional products such as anti-aging creams and sunscreens. On the basis of region, Asia-Pacific dominated the personal care ingredients market in 2016. Growing population and rapid urbanization, along with the increase in per capita spending on personal care products in highly developing economies such as China, South Korea, India, and Indonesia is contributing towards the growth of the personal care ingredients market in this region. In addition, increasing availability of affordable personal care products also helps drive the personal care ingredients market. Major players such as BASF SE (Germany), Croda International Plc. (U.K.), Clariant AG (Switzerland), Akzo Nobel N.V. (Netherlands), and Wacker Chemie AG (Germany) are setting up plants and technical centers in the Asia-Pacific region. Personal care ingredients find their major application in skin care products. Some of the common ingredients used in the formulation of skin care products are emollients, emulsifiers, surfactants, thickeners, antioxidants, active agents, antimicrobial, hair fixative agents, and conditioning agents among others. The skin care product segment caters to various skin related problems such as anti-ageing, fairness, acne, and cracking skin. The various types of skin care products are lotions and face & hand creams. Oral care refers to the practice of keeping the mouth and teeth clean. Following the basic oral care helps one to prevent their mouth and teeth from infections. The most commonly used oral care products include toothpaste, mouth fresheners, tooth powders, and mouthwashes among others. Surfactants are mainly used in the production of toothpaste and tooth powders. Which are the emerging potential market for personal care ingredients? One of the key factor restraining the growth of the personal care ingredients market is the stringent regulations for personal care products by different government entities such as European Commission Cosmetics Directive (ECCD), U.S. Food and Drug Administration (FDA), and China Food and Drug Administration (CFDA). Companies are focusing on strengthening their position in the personal care ingredients market through expansions, acquisitions, and new product launches. Major players active in the market include Ashland Global Holdings Inc. (U.S.), BASF SE (Germany), Croda International Plc (U.K.), Evonik Industries AG (Germany), Lonza Group Ltd. (Switzerland), Solvay SA (Belgium), Akzo Nobel N.V. (Netherlands), Clariant AG (Switzerland), The Dow Chemical Company (U.S.), and Wacker Chemie AG (Germany). 10.1 Ashland Global Holdings Inc.
10.11.8 Momentive Performance Materials Inc.